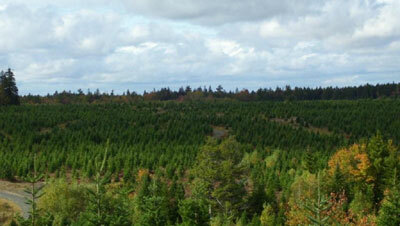 Why Are Nova Scotia Balsam Firs Superior ? Why does the World Wide market buy Christmas trees grown exclusively in Nova Scotia? Lunenburg County, Nova Scotia is the Christmas Tree Capital because it has the highest quality, best price Christmas Trees in the world. How are we able to make this claim? 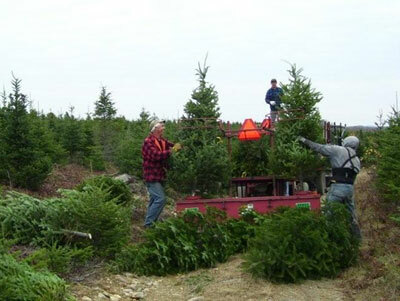 The Nova Scotian climate is perfect for growing Balsam Fir with cold, harsh winters and warm, wet summers. These conditions cause the trees to grow slowly with full, thick needles. Our robust natural trees will retain their great fragrance and vitality throughout the season and into the new year. What constitutes a perfect tree? The rich balsam aroma that fills your home is unsurpassed with trees grown in Nova Scotia. Symmetry is guaranteed because only the best trees have been used for seedlings. Variety in density is key when considering the interest of the customer. Whether you are looking for a heavy density tree or a light density balsam with more room for decorations, Naugler's provides it all. Naugler's provides a full selection of tree heights. We sell everything from the extra tall 20' tree to the table-top tree. Regardless of the height; density, shape and smell are guaranteed to satisfy even the most picky customer. Whether you're looking for a few balsams to complement your retail lot or thousands shipped anywhere in the world, Naugler's Balsam Firs can help. Our experienced tree consultants can help assure your success in managing a retail stand. Over the years we have helped many clubs and organizations. When you sell the freshest and best trees you can not lose. We offer them at the most competitive prices in the world! Increase your sales and profits!! Contact Randy Naugler. Quality is assured when you buy from us. The technique involved in packing and shipping is extremely important in this industry. Our very experienced and professional staff ensures proper tree handling and efficient packing. Naugler's track record of quality speaks for itself.